Summer is here (it feels so good to say that!) and in my house that means one thing — Basil Pesto. You might remember we talked about it last year at the end of the summer when I posted my Lightened Up Basil Pesto. I grew basil plants all summer just to make homemade pesto for my husband’s birthday dinner. This year I am being a bit more realistic about what I am capable of growing in my Western-facing-yet-tree-covered house so I am stocking up on basil at farmers markets and supermarkets. It’s not such a bad thing because they all have plenty of it. Since our eating has changed so much in the past year and my standby pesto is loaded with yummy Parmesan cheese, I decided to create a Paleo Pesto Recipe based on my traditional Basil Pesto. The secret ingredient here is 1 Tablespoon of nutritional yeast. Just enough to add that umami flavor but not enough to overwhelm the basil, garlic, pine nuts or oil. Make sure you use the freshest garlic possible. If you cut into the garlic cloves and see a vein of green, the garlic may be bitter in your pesto. I usually store homemade pesto in small mason jars. Think of this like Guacamole – the less air, the better. Fill the jar or container to the very top, immediately cover and refrigerate or freeze for later. When you use some, use a piece of wax paper to press down on the top and limit air exposure. Toast the pine nuts by heating a large skillet over medium-high heat. Place the pine nuts in one even layer and cook 4 to 5 minutes, turning and tossing frequently. Paleo Pesto Recipe. Vegan, Paleo and Naturally Gluten Free, this delicious Pesto freezes well and can be made in minutes! Combine all ingredients except olive oil in the bowl of a food processor or blender. Process until smooth and slowly add in olive oil. Transfer finished pesto to storage jars or serve and Enjoy! Thank you so much Devorah! I bet this is fantastic with ramps! It says to “see notes” about the garlic…but I’m not seeing the notes….sorry – maybe I’m overlooking them. Any special directions?? The notes are listed right above the recipe in the body of the post! Ah…yes! Sorry! I was looking below. Got it! Looks yummy! Is there another alternative for the Pine Nuts – nut allergy! Hi Fanny – you could use toasted sunflower or pumpkin seeds. The taste will obviously be a bit different so taste and adjust seasonings if necessary. Maybe we could use walnuts? I will make it tomorrow and let you know! How did it turn out with walnuts? Delicious! For me walnuts are a daily treat-full of omega 3-so I love that taste. Hello! I am new to making pesto. 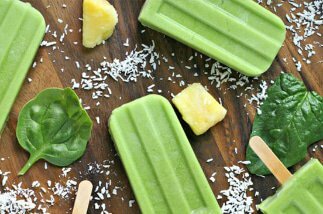 You mentioned that it could be frozen – is it possible to freeze it in an ice cube tray then put it into a freezer bag? I wasn’t sure if it would be possible because you mention that it needs to be kept from the open air….Thanks! Hi Kelly! Absolutely – an ice cube tray is perfect for freezing pesto cubes. Great idea on the oil Margot! I am on a yeast and sugar free diet for IC. Can I leave out the yeast? Sure Patsy! It will change the taste a bit though so just be prepared for that. Five stars! Absolutely delicious! Wouldn’t have believed a dairy-free, wheat-free meatball could be so good. Thank you! I don’t can that much but I think this is a perfect candidate! This looks great! Going to try it next time I can get some basil from the farmers market. My aunt turned me on to nutritional yeast earlier this year because she eats mostly vegan. I actually really like the taste as a substitute for things where I’d otherwise sprinkle parmesan cheese. I wouldn’t have thought of putting it into pesto, though! Whole Foods makes a great vegan pesto with fresh spinach and basil that they sell in the store-made refrigerated area that I really like. Can’t wait to try this. Spinach or Kale are great pesto add-ins. They also help to keep your pesto bright green, which is an added bonus. I LOVE nutritional yeast. Especially on coconut oil popped popcorn – my occasional super-treat! I love nutritional yeast – sometimes I eat a spoonful of it (just be careful not to inhale ;). This sounds so good, we eat pesto all through the summer. Me too Jeanette – I LOVE it so much. Can you somehow incorporate your notes into the print version of the recipe? That is a really great idea – I’ll look into it! I love pesto and need to make some more to stash in the freezer! 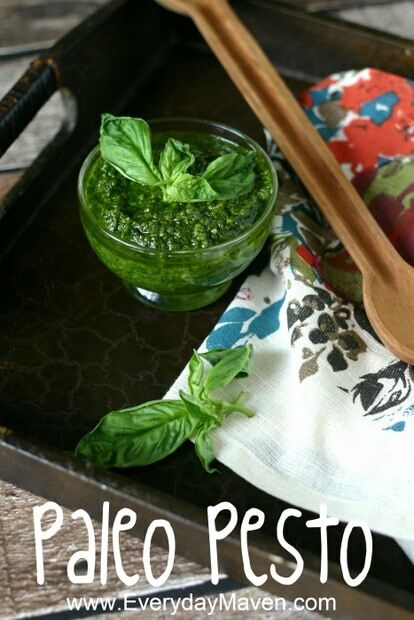 I love pesto, how wonderful that you were able to create a paleo version! Nice take on pesto! I do like the cheese, but when I’m freezing it I make it without and freeze – then mix cheese in when I’m ready. Fortunately we can grow basil, but it’s easy to buy great quality at this time of the year, so maybe I should devote garden space to something else. Fun recipe – thanks. I used to do the same thing with the cheese. This version is nice because you don’t even have to worry about adding anything in! What a lovely bright a delicious pesto!! Thanks so much – we have been using it on EVERYTHING! Love this! It’s really the perfect way to use up some of my large store of nutritional yeast! Joanne – have you ever tried Nutritional Yeast on popcorn? OMG, sooooo good! How exactly do you add nutritional yeast to popcorn?